Bread is so basic, yet what beats the aroma of freshly baked bread filling the kitchen? There are two types—yeast bread and soda bread. I’ll give you one of each here—both made in rather unconventional ways. If you haven’t tried to bake your own, I encourage you to. It’s satisfying, and the varieties of flour, other additions, and forms they can take can jazz up your meal times. Not to mention, the nutritional value beats that soft airy loaf you buy at the grocery store. You know exactly what goes into your masterpiece. No chemicals or transfats. Pure, wholesome, and delicious. The first two recipes appeared in my newspaper column. The third recipe is for a quick and easy Tabouli Bread made using frozen bread dough. Enjoy! “Artisan” means individually crafted, sometimes rustic. That describes this loaf, which is far from looking mass-produced. I first heard about this bread, which calls for only four ingredients and no kneading, from several sources online. My first was from Paula Fowler, a former director of the Presque Isle Chamber of Commerce. Paula lives in Kentucky now, and we stay in touch on Facebook. Paula says, “I am completely obsessed with this bread. This is insanely easy. It literally took 2 minutes to stir together. Let it sit overnight and bake in the morning.” This is a great way to get your kids introduced to bread making, and yourself if you’ve never made bread in your life! In a large mixing bowl, whisk together flour, salt, and yeast. Add water and mix until a shaggy dough forms. Don’t overwork. Cover bowl and set aside for 8-18 hours or overnight till risen and bubbly-looking on top. When dough is ready, preheat oven to 450 degrees F. Place your Dutch oven, uncovered, into the preheated oven for 30 minutes. While your Dutch oven preheats (no greasing needed), turn dough onto a well-floured surface and, with floured hands, form the dough into a ball. Cover dough loosely with plastic wrap and let rest. Cover and bake 30 minutes. Remove cover and bake another 7-15 minutes, uncovered, till golden brown and crusty. Cool about a half-hour and slice with a bread knife. Enjoy! 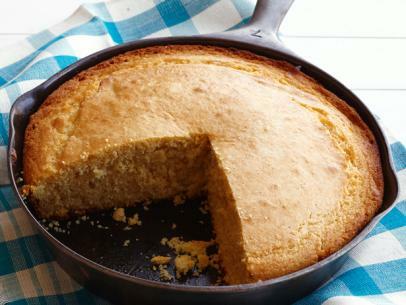 This bread uses toasted cornmeal that makes it extra good tasting, plus it is gluten-free since it contains no wheat flour. It is a soda bread that requires no kneading—just a little jockeying around of pans. Set oven racks to middle and lower middle positions and heat oven to 450°. When hot, place a 10-inch cast iron skillet on the middle rack for 10 minutes. Meanwhile, spread cornmeal in a rimmed baking sheet and toast in oven on the lower rack about 5 minutes, then transfer to a large bowl. Mix with sour cream and milk. Add oil to skillet in oven and heat another 5 minutes. Remove from oven and add butter. Melt and pour it, mixed with the oil, into the batter in bowl. Whisk in remaining ingredients with eggs being last. Quickly scrape into hot skillet and smooth the top of batter. Transfer skillet to middle rack of oven and bake for 12-15 minutes, rotating to lower rack midway through. 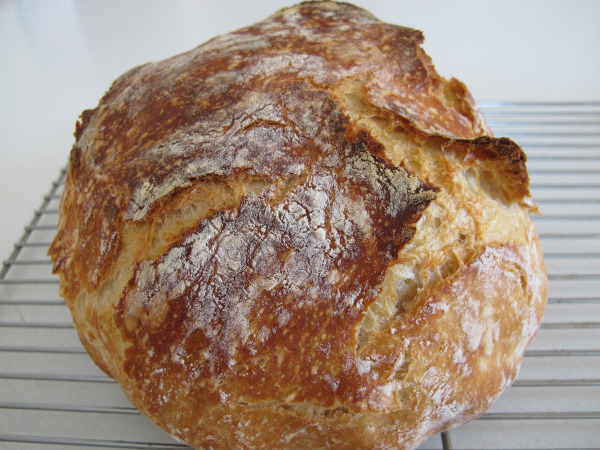 Bread is done when edges are golden brown and a toothpick inserted into the middle of the bread comes out clean. Cool 10 minutes. Best served immediately, but will keep a few days in the refrigerator—if it lasts that long! This is a delicious stuffed bread with a Lebanese flair. Frozen bread dough gives you a distinct head start. I defrost mine in the microwave, but you can take it out of the freezer early on the day before, and it will thaw just fine. Follow directions on the package. Bulgur is a type of cracked wheat (also called burghul) that can be found in larger grocery stores and also in Sleeper’s in Caribou. In a bowl, combine warm water and bulgur. Let stand 1 hour. Drain, pressing out excess water. Combine bulgur with tomato sauce, chopped tomato, parsley, lemon juice, cinnamon, and mint. Set aside. On a floured surface, roll dough out to a 20 x 10-inch rectangle. (If dough is too elastic, let it rest for 15 minutes.) Once it is rolled out, cover top of dough with the olive oil. Spread the bulgur mixture over the dough to within 1 inch from the edges. Evenly sprinkle on the pine nuts. Roll up the dough jelly-roll style from the long edge. Moisten and seal edge and ends. Starting from one end of roll, coil roll loosely in a snail fashion and place seam side down in a greased 9 x 1½-in round pan. Cover and let rise till nearly double, about 45-60 minutes. Meanwhile, preheat oven to 375°. When risen, bake 35-40 minutes, covering with foil the last 15 minutes if necessary to prevent overbrowning. Spread butter on top of hot loaf. Cool on a wire rack and cut into wedges to serve. Thaw bread dough in the refrigerator overnight if you can’t watch it all day. This entry was posted in Bread, Lebanese and tagged artisan bread, bread dough, Dutch oven, frozen bread dough, soda bread by cmtstardesign. Bookmark the permalink.